Living Area 1,541 Sq. ft. 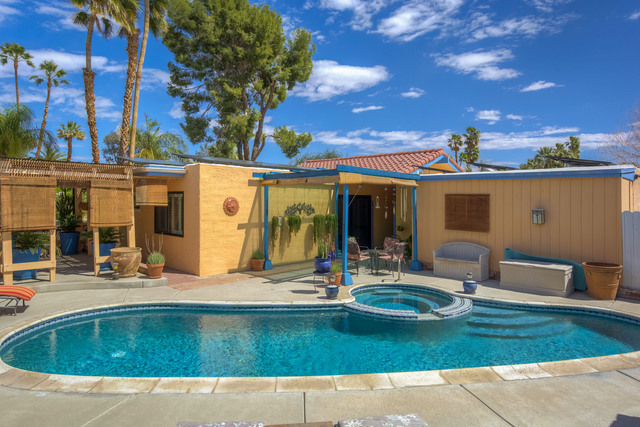 This Central Palm Springs’ Sun Villas home, located at the end of a cul-de-sac is surrounded by many beautifully upgraded homes, majestic Mt. San Jacinto views and very close to the heart of our vibrant Downtown Palm Springs – packed with energy, excitement, restaurants, shopping, social establishments, The Spa Casino and so much more. This 3bdrm/2 ba home has a spacious living room with vaulted ceilings, floor-to-ceiling fireplace and adjacent sun room amid an abundance of large windows and French doors leading to a very private rear yard with private heated pool & spa and various seating areas. Features of the open and convenient kitchen include, Corian counters, updated appliances & cabinetry. The master suite has a walk-in closet and updated bath. Dual-pane windows, a lifetime warranty on exterior paint in addition to a two-car enclosed garage and a low maintenance desert landscaped front yard. New energy saving solar installed 2017. Solar is $202.29/mo. – 20 yr lease. Extended land lease (2062) is only $337.46/month.